Hey, Folks! You know we love those sports games and tonight was shaping up to be a great one. There's nothing we love more than the grid iron and the pig skin and . . . the goal post. As hard as it was to tear myself away from all the action on the turf I somehow found the strength to tear myself away from the big game and make some food. I started with this salad with baby greens, cilantro leaves, lime, olive oil, salt and pepper. I used this salad as a base to serve some guac and chips. Not guacamole, mind you, guac. I love guac. 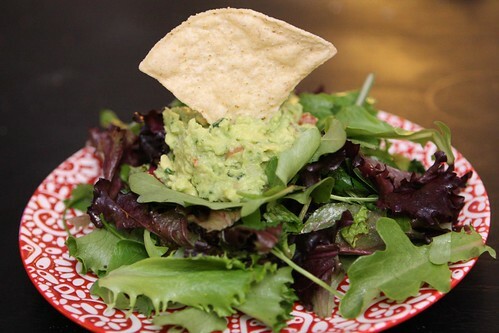 It's guactastic. 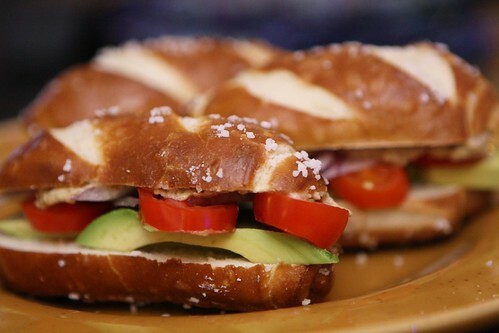 It's hard to tell in this photo but these are tiny little finger sandwiches made with avocado, tomato, and red onion on mini pretzel rolls with Sierra Nevada stout mustard. Jen had mentioned she might want a Philly Cheesesteak. 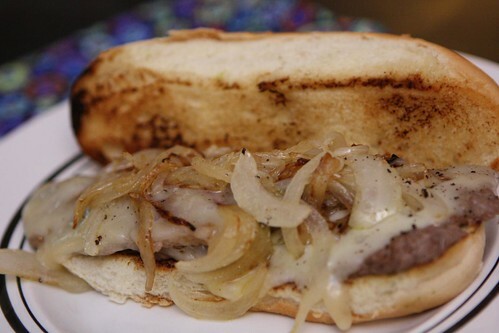 Since I'm a bad listener I made this which is not really anything of the sort but rather some thinly sliced, seared sandwich steak with carmelized onion and melted provolone on a grilled bun. I call it a "Filly" Cheesesteak because if fills you up. That was even lamer than my initial idea of naming it the Phily Cheesesteak after Phil Lynott of Thin Lizzy but I wasn't able to determine how to make a Thin Lizzy-themed cheesesteak. Presumably with a large spherical tuft of parsley. After the cheesesteak I served up a baked potato. A real baked potato done in the oven! Sure it takes about an hour-and-a-half longer than in the microwave but the texture difference is actually quite pleasing. 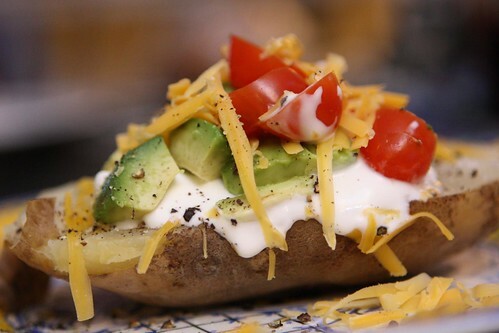 I topped the baked potato with sour cream, cheddar, tomato, avocado, salt, and pepper. For beer I decided I wanted to do something as traditionally American football as possible. 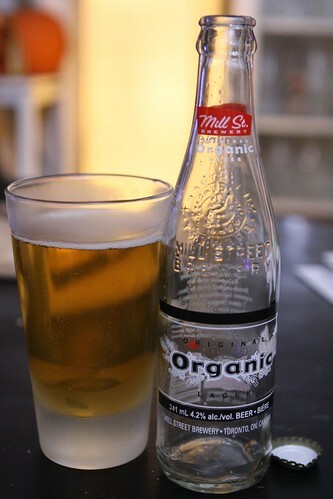 I selected the only lager in the fridge, this Organic Lager from Mill St. Brewery in Toronto, Ontario. Sure, a beer from Canada might be viewed as an abomination for an American football game but I couldn't decide between Canadian lager or some sort of American craft stout or something. The latter seemed somehow less traditional. This lager impressed me quite a bit. It tasted every bit like what you'd expect an American (or North American) lager to taste like except there was a prevailing crisp and clean taste. Maybe it's the Canadian touch, maybe it's the organic ingredients, maybe it's the fact that it's brewed in small batches. Something about this lager was just tasty. Maybe it was merely enhanced by the goal-scoring, punt-kicking, pigskin-having excitement that has been blasting from our television screen for the past few hours. "filly" because it last ran at Aqueduct?